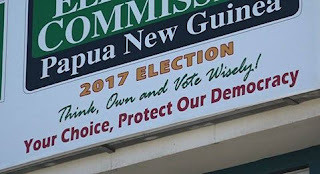 The Electoral Commissioner of Papua New Guinea (PNGEC) has been directed by Prime Minister Peter O'Neill to take a paid advertisement in the papers to explain his decisions regarding the changes to the election. Among these explanations would be the reason for printing ballot papers in Indonesia and the reduction of the campaign period. Mr O'Neill reiterated in Parliament last week that the Government does not have any hand in the decisions made by the Electoral Commissioner. He also confirmed that the Issue of Writs will be on the 20th April. "We will give every transparency and visibility for everybody and we encourage the electoral commissioner to be transparent and accountable to the people of Papua New Guinea," said O'Neill.